Wassily Kandinsky (Russian, 1866-1944). 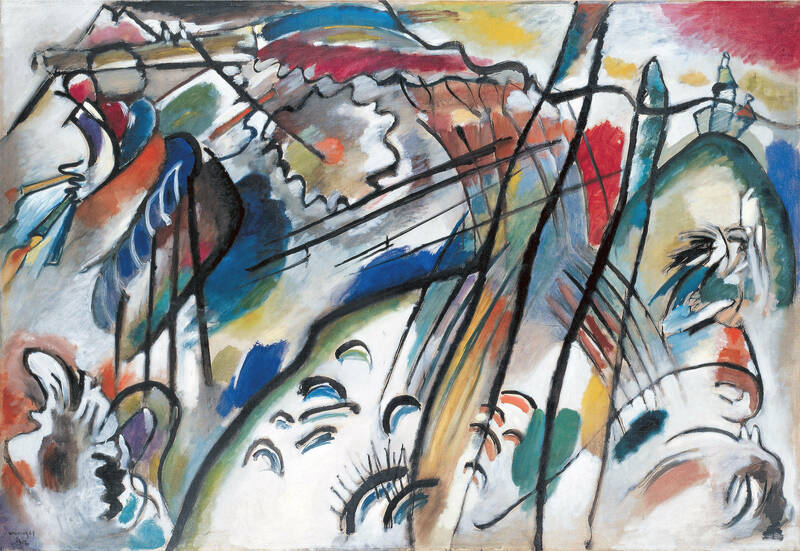 Improvisation 28 (second version) (Improvisation 28 [zweite Fassung]), 1912. Oil on canvas. 43 7/8 x 63 7/8 in. (111.4 x 162.1 cm). Solomon R. Guggenheim Founding Collection, By gift 37.239. Solomon R. Guggenheim Museum, New York / © 2009 Artist Rights Society (ARS), New York/ADAGP, Paris. Art History courses need improv. Before that ‘x’ in the upper right corner is clicked and you move on to another article, I’m not referring to the joke-cracking schtick you may be thinking of. I’m talking about the communication skills, teamwork and confidence that improv provides – an essential to an engaged classroom environment. Professors expect a lot from students. I’m not too far removed from my generalist academic background, so I can still remember some very awkward class discussions. Students fall in three different groups – you have the students always sharing, the students that want to share but are afraid to, and the disengaged. A group voice develops with the sharers, causing the middle group to retreat further and the disengaged to become even more so. Most of my professors tried to include the whole class, but eventually just actively engaged with the students who were interested in participating. Improv can change that. Improv is all about listening and paying attention. It’s about starting from nothing and developing a relationship based on ideas from the participating individuals. In order to properly create a reality, improvisers need to listen carefully to each other and respond with the idea of Yes, And in mind. Yes, And is all about agreeing and contributing information. Someone says something and you affirm it and add additional information. Sounds a bit like every formal analysis, doesn’t it? Yes, And is directly connected to the principle behind inquiry. In order to complete a successful inquiry, we have to listen. An easy Yes, And inquiry activity involves looking at a work of art. A student notices something and makes a statement. Another student says yes, repeats the statement without paraphrasing, and adds information. This continues through the class, giving everyone a chance to speak. The next student affirms and repeats just the previous addition – the ‘and’ – then adds more information. The trick is really in the repeat – we tend to paraphrase things to what we think we hear, and often times the meaning of the original statement is changed. In this activity, the words ‘but’ and ‘no’ are off limits – affirmation is key. The students are affirmed by each other and are stating observations – all while listening closely to each other. Classroom culture is often a hierarchy. We’d be lying if we didn’t acknowledge the resentment that happens between students. Having a classroom where students look out for each other and teamwork was a constant would be not only beneficial to the other students, but also the teacher. Teamwork in improv is imperative. Aside from the Yes, And, as an improviser, you have everyone’s back. Your job is to make the other people look better and you in turn, look better as well. By creating a supportive classroom environment, students stand behind ideas and feel free to support their fellow classmates. A sense of group was missing from almost all of my art history classes – these are the contemporaries art history students need to network with for life after college. An activity that establishes a teamwork mentality is one I’ve played in every team building workshop and improv class I’ve ever led. ‘Hot Spot‘ starts with everyone standing in a circle and one person in the center. That person starts singing a song. At any point, if anyone on the outside circle recognizes it, they start to sing along. When that song reminds anyone of another song, the person in the center gets tapped out and a new song begins. You never want to be stuck in the center, constantly depending on everyone else to back you up and take their turn. You back everyone else up and take time in the center, and a sense of group is established. What better ice breaker than singing in front of a group? Oh, the times I was terrified to state my opinion in a classroom discussion for fear of being wrong. That fear of failure is consuming; we are terrified of making a mistake, getting judged, receiving a bad grade. Failure is where we learn – and we build confidence by taking chances. In improv, failure is celebrated. A lot of improv is terrible. What makes it endearing and fun is the ability to fearlessly go onstage and make big choices. The fear of failure is addressed in improv and confidence is built through those big choices. Zip, Zap, Zop is an incredible activity to get people out of their heads and away from the fear of failure. The group stands in a circle, and one person points at another, saying Zip. That person points at another person, saying Zap, and that person chooses another, saying Zop. Then it all starts over. The idea is to go very fast – when someone makes a mistake, (because it WILL happen – if it doesn’t, the group is going too slow,) the whole group puts their hands on their hips and hip-thrusts towards the center, yelling “Ah-oohga!” The person who made the mistake gets control, and starts it over on Zip. A nonsensical word, accompanied by a silly gesture and laughter happens with failure, and we all relearn that making a mistake is not as bad as we thought it would be. Love the idea of the Yes, And approach. I’ll use this next semester! Thank you.